00062 Flux-Cored Wire .030 2 lb. 00064 Flux-Cored Wire .030 10 lb. 00067 Flux-Cored Wire .030 25 lb. 00072 Flux-Cored Wire .035 2 lb. 00074 Flux-Cored Wire .035 10 lb. 00077 Flux-Cored Wire .035 25 lb. 00082 Flux-Cored Wire .045 2 lb. 00084 Flux-Cored Wire .045 10 lb. 00087 Flux-Cored Wire .045 25 lb. 00652 70S-6 MIG Wire .023 2 lb. 00654 70S-6 MIG Wire .023 10 lb. 00657 70S-6 MIG Wire .023 33 lb. 00662 70S-6 MIG Wire .030 2 lb. 00664 70S-6 MIG Wire .030 10 lb. 00667 70S-6 MIG Wire .030 33 lb. 00672 70S-6 MIG Wire .035 2 lb. 00674 70S-6 MIG Wire .035 10 lb. 00677 70S-6 MIG Wire .035 33 lb. 10682 70S-6 MIG Wire .045 2 lb. 10684 70S-6 MIG Wire .045 10 lb. 10687 70S-6 MIG Wire .045 33 lb. 10692 70S-6 MIG Wire .0625 2 lb. 10694 70S-6 MIG Wire .0625 10 lb. 10697 70S-6 MIG Wire .0625 33 lb. 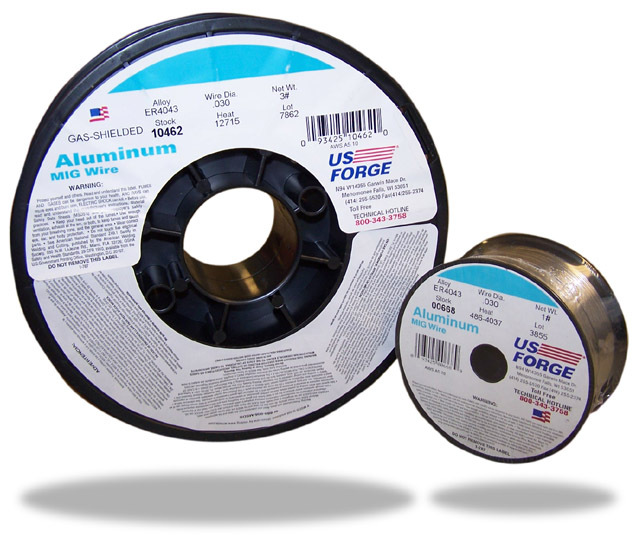 00471 Flux Cored Hardfacing Wire .035 1 lb. 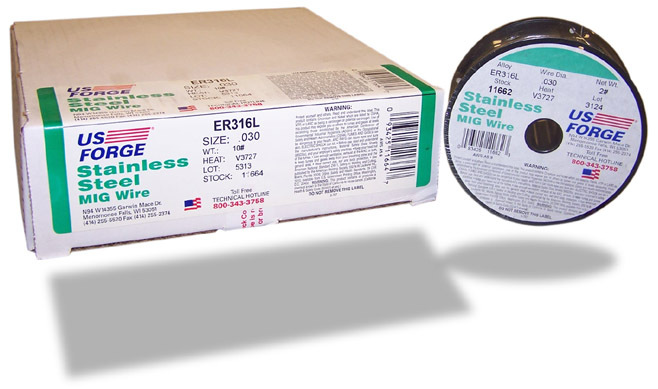 00481 Flux Cored Hardfacing Wire .045 1 lb. 00668 ER4043 MIG Wire .030 1 lb. 10462 ER4043 MIG Wire .030 3.25 lb. 00669 ER4043 MIG Wire .035 1 lb. 10472 ER4043 MIG Wire .035 3.25 lb. 10482 ER4043 MIG Wire .045 1 lb. 00678 ER5356 MIG Wire .030 1 lb. 10562 ER5356 MIG Wire .030 3.25 lb. 00679 ER5356 MIG Wire .035 1 lb. 10572 ER5356 MIG Wire .035 3.25 lb. 10852 ER308L MIG Wire .023 2 lb. 10854 ER308L MIG Wire .023 10 lb. 10857 ER308L MIG Wire .023 30 lb. 00676 ER308L MIG Wire .030 2 lb. 00675 ER308L MIG Wire .030 10 lb. 10867 ER308L MIG Wire .030 30 lb. 10872 ER308L MIG Wire .035 2 lb. 10874 ER308L MIG Wire .035 10 lb. 10877 ER308L MIG Wire .035 30 lb. 10882 ER308L MIG Wire .045 2 lb. 10884 ER308L MIG Wire .045 10 lb. 10962 ER309L MIG Wire .030 2 lb. 10964 ER309L MIG Wire .030 10 lb. 10967 ER309L MIG Wire .030 30 lb. 10972 ER309L MIG Wire .035 2 lb. 10974 ER309L MIG Wire .035 10 lb. 10977 ER309L MIG Wire .035 30 lb. 10982 ER309L MIG Wire .045 2 lb. 10984 ER309L MIG Wire .045 10 lb. 10987 ER309L MIG Wire .045 30 lb. 11652 ER316L MIG Wire .023 2 lb. 11654 ER316L MIG Wire .023 10 lb. 11657 ER316L MIG Wire .023 30 lb. 11662 ER316L MIG Wire .030 2 lb. 11664 ER316L MIG Wire .030 10 lb. 11667 ER316L MIG Wire .030 30 lb. 11672 ER316L MIG Wire .035 2 lb. 11674 ER316L MIG Wire .035 10 lb. 11677 ER316L MIG Wire .035 30 lb. 11682 ER316L MIG Wire .045 2 lb. 11684 ER316L MIG Wire .045 10 lb. 11687 ER316L MIG Wire .045 30 lb. 11876 ER308-FCO .035 1 lb. 11878 ER308-FCO .045 1 lb. Part # Description Size Pkg. 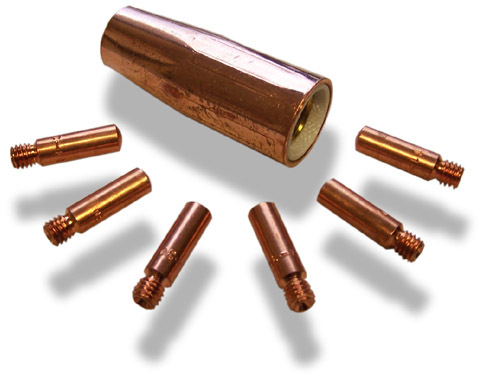 US FORGE is in no way affiliated with LINCOLN ELECTRIC or TWECO PRODUCTS, Inc. The parts advertised for sale are not genuine Lincoln Electric or Tweco Products, Inc. parts. References to Lincoln Electric and Tweco Products, Inc. ; MIG guns and numbers are for your convenience only.